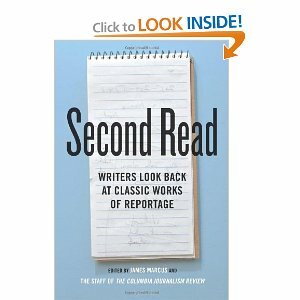 I just finished a book that surprised me — Second Read: Writers Look Back at Classic Works of Reportage. I found it surprising because when I first picked it up, I thought it would be yet another anthology of great works of journalism, perhaps with brief headnotes introducing each one. Instead, this is a collection of well-considered essays by contemporary writers about some of the great works in the history of (mainly American) journalism. The overall editor is James Marcus of Columbia’s J-School, and he drew on the faculty and the masthead of CJR for most of the entries. A few of these essays pointed me to works that I have never read and now want to catch up with (DeFoe’s “A Journal of the Plague Year,” Paul Gallico’s “Farewell to Sport,” Cornelius Ryan’s “The Longest Day”). Others were meditations on familiar works that made them fresh again (Evan Cornog on Liebling’s “Ear of Louisiana,” Scott Sherman on Frady’s “Wallace,” David Ulian on Didion’s “Slouching Toward Bethlehem”). My only regret is that this book does not include the originals — or at least significant excerpts — that are being celebrated. I am sure a publisher can explain why this book can make a little money at 184 pages and would lose a fortune at 1,840 pages. Oh, well. Off to the library to hunt down the originals. If you have any interest in journalism history or “literary journalism,” don’t missSecond Read.